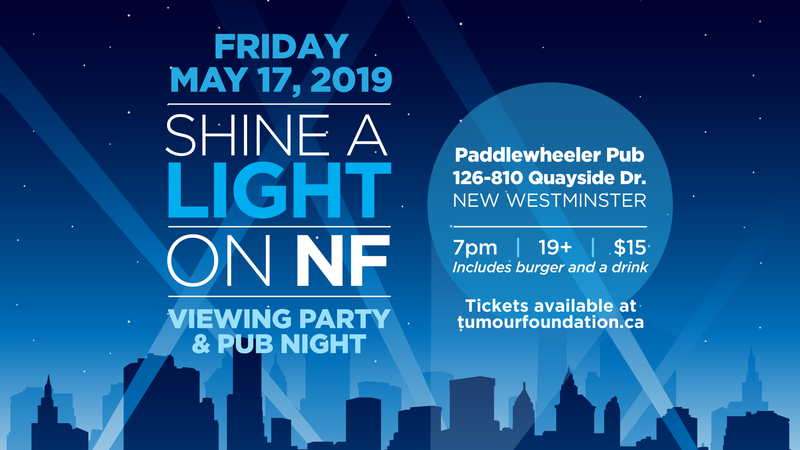 You are invited to shine YOUR light, with other members of the NF community on May 17th as we celebrate World NF Awareness Day! This community event (19+) at the Paddlewheeler Pub in New Westminster will bring together community, good food and fun. We will also watch the Anvil Centre, across the way, light up for NF. Your $15 ticket includes a burger (choice of beef, chicken or veggie) and a drink (choice of a bar cocktail, house wine or a sleeve of PW Pilsner). We invite you to wear BLUE and GREEN so we can really be seen! as we bring NF out of the shadows together.